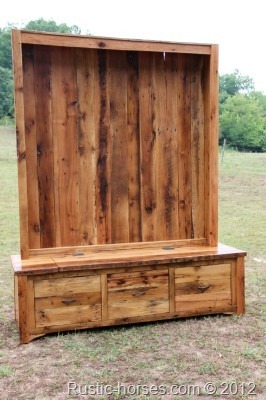 This hutch we recently made for a couple building a new house, it goes on one side of a rock fireplace and our Entertainment Hutch goes on the other side. They plan to put a large picture in the open space and blankets in the seat. It could also be used as a hall tree with coat hooks, or maybe with a picture collage in the open space, or maybe a giant piece of art or such. 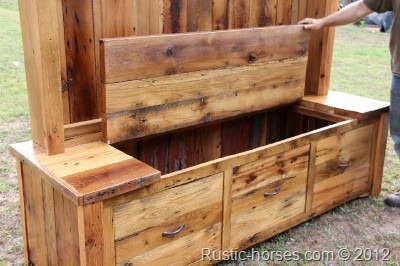 If it were in our house it would probably have hooks for cowboy hats and our fanciest bridles. What would you put on it? What would you put in it? We would love to design and build one for you. Contact us. 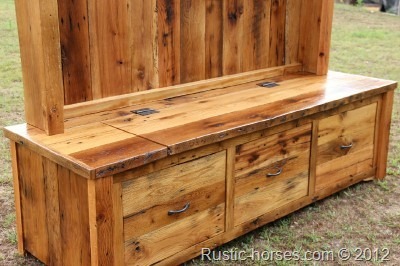 Made from authentic oak barnwood. That is absolutely GORGEOUS! I would love to know the pricing on this.